Is Coumadin a blood thinner? 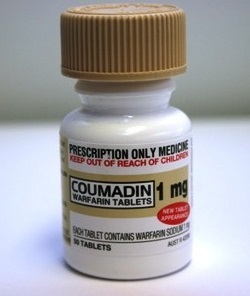 Coumadin is a Brand name for an anticoagulant (or blood thinner) drug that contains warfarin as an active ingredient. Warfarin prevents the formation of blood clots as well as their migration by inhibiting vitamin K-dependent coagulation factors. Coumadin is indicated for: treatment and prophylaxis of venous thrombosis and pulmonary embolism as its extension, treatment and prophylaxis of thromboembolic complications associated with atrial fibrillation and/or cardiac valve replacement, reduction of recurrent myocardial infarction and thromboembolic events (such as stroke or systemic embolization) after myocardial infarction and therefore the reduction the risk of death. Coumadin has no effects on an established thrombus, and can’t reverse ischemic tissue damage. The main targets of anticoagulant therapy are to prevent further extension of the formed blood clot and to prevent the risk of secondary thromboembolic complications that may result in serious and possibly fatal outcomes. Despite its effectiveness, warfarin therapy has several issues. Many drugs interact with warfarin, as well as some foods (such as leaf vegetable foods because they typically contain large amounts of vitamin K1) and its activity has to be monitored by blood testing for parameter INR – International Normalized Ratio to be ensured that adequate safe dose is taken. If INR value is high, patients are predisposed to an increased risk of bleeding, while low INR values indicates that the dose of warfarin is uneffective to protect against thromboembolic events. Other Brand names for warfarin products on the market are: Jantoven, Marevan, Farin, Waran and Warfant. Is Ibuprofen a blood thinner? How does Coumadin and Ibuprofen work in the body? Warfarin works by inhibiting the enzyme activity of vitamin K reductase, which results in depletion of vitamin KH2 – the reduced form of vitamin K.
Vitamin K is a cofactor for the carboxylation reactions of glutamate residues of vitamin K-dependent proteins, so this inhibition limits the gamma-carboxylation reactions and activation of the vitamin K-dependent coagulant proteins. Therefore, the synthesis of vitamin K-dependent coagulation factors II, VII, IX, and X and anticoagulant proteins S and C is inhibited. Decreased levels of 3 of the 4 vitamin K-dependent coagulation factors (II, VII, and X) results in decreased prothrombin levels in blood and a decrease in the amount of thrombin generated and bound to fibrin. This reduces the thrombogenicity of clots. Can patients take Coumadin and Ibuprofen together? Patients on a Coumadin anticoagulant therapy should be very careful before taking any drugs for aches and pains. Taking NSAID (non-steroidal anti-inflammatory drugs) such as ibuprofen, naproxen, diclofenac, ketorolac, aspirin or other NSAID for pain relief together with Coumadin can increase the risk of serious bleeding. However, pain relievers that contain acetaminophen can be the best choice, and many doctors will recommend it. So, patients should never take Coumadin and Ibuprofen together without medical advice. 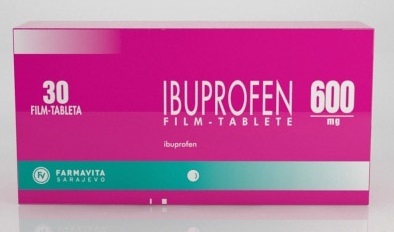 Ibuprofen may impair the function of platelets which are important for blood clotting, while Couamdin impairs blood clotting in a different way, by impacting the INR level. Although there is no direct interaction between the two medicines, if they are taken together at the same time, they will attack the body’s ability to do blood clotting in two separate ways. This could greatly increase the risk of having significant bleeding. Prothrombin time or INR should be monitored closely in patients on Coumadin therapy. Patients should be advised to contact their doctor if they develop signs and symptoms of excessive anticoagulation, such as: bruising, vomiting, unusual or prolonged bleeding, headache, dizziness, change in stool or urine color, or weakness. The table below shows the incidence of side effects after Coumadin and Ibuprofen administration in recommendable doses. The incidence can be increased if these drugs are taken together or overdosed. Patients should tell their doctor and pharmacist if they are allergic to Coumadin or Ibuprofen, or any other medications, or any of the ingredients in these products. Patients should tell their doctor and pharmacist what prescription and nonprescription medicines, nutritional supplements, vitamins and herbal preparations they are taking or plan to take. There are many drugs that have interactions with warfarin and those interactions can cause serious side effects. Patients should tell their doctor and pharmacist if they have or have ever had diseases such as: atherosclerosis, diabetes, some liver or kidney disease, bleeding problems, porphyria, cardiovascular disease such as chest pain (angina), arrhythmias, high blood pressure or heart attack; an underactive adrenal or pituitary gland, or any condition that makes swallow difficult. Patients should also tell their doctor if they are pregnant or plan to become pregnant or if they are breast-feeding. If they become pregnant while using these drugs they should call their doctor immediately. Pregnant women should not take warfarin unless they have a mechanical heart valve, but only with medical supervision. Coumadin may harm the fetus. Cigarette smoking may decrease the effectiveness of Coumadin. Patients should tell their doctor if they have or have ever had any of following conditions such as: asthma, frequent stuffed or runny nose or nasal polyps, swelling of the inside of the nose, swelling of the arms, feet, ankles, hands, or lower legs; lupus or liver or kidney disease. Patients should mention to their doctor if they are using following drugs: ACE inhibitors such as: enalapril , fosinopril, lisinopril, benazepril, captopril, moexipril, diuretics lithium and methotrexate. Doctor may need to change the doses of these medications or monitor more carefully for side effects. Patients should not take nonprescription ibuprofen with any other analgesic unless doctor tells that should. If patients are giving ibuprofen to a child, it is important to tell the child’s doctor if the child has not been drinking fluids or has lost a large amount of fluid from repeated vomiting or diarrhea.